You know what goes great with just about anything? Onions! Yep, that's right, onions. Use yellow ones in your favorite French onion soup recipe, sweet onions for caramelizing, and red onions for salads and salsas. 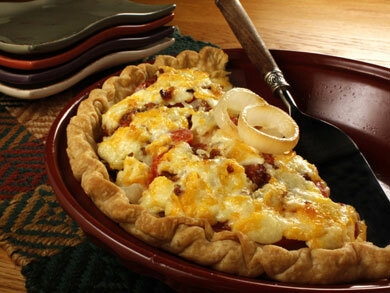 Onions are so versatile, you can even use them to make onion casseroles and onion pies! Is there anything an onion can't do? To learn How to Cut an Onion, How to Store Onions, and all about the different Types of Onions, visit our information pages! In the meantime, we've collected our favorite onion recipes for you to try. We' love it if you let us know how you liked them in the comments section of each recipe. 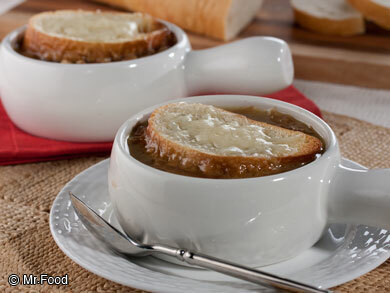 French Onion Soup: There's a secret ingredient in this easy French Onion Soup recipe that will surprise you. Try it for yourself and see why this is one of the most popular onion soup recipes we have ever shared! Beefy Onion Soup: This beefed-up version of a classic French onion soup recipe gets its heartiness from beef chuck steak and beef broth. Serve it however you like it! 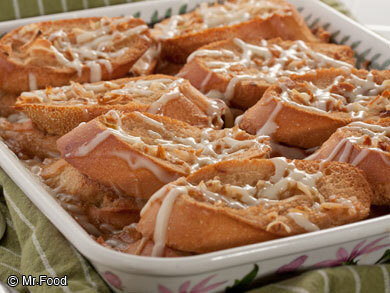 It's company-fancy yet weeknight-easy! Onion Pie: Don't be fooled by the name. No, Onion Pie is not a dessert! It's a side dish that's a super go-along for meat, chicken, or fish. The original version of this comes from a viewer from Ireland, but we think it's a cross-cultural hand-me-down. 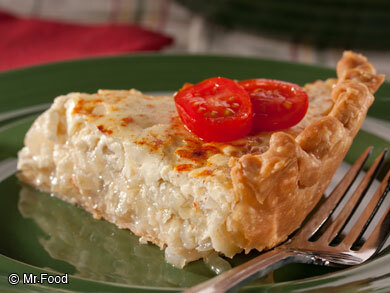 Sweet Vidalia Pie: Sweet Vidalia Pie is almost like a quiche but minus the eggs! This incredibly "easy as pie" recipe is best with in-season Vidalia onions and will fit a light lunch or be the perfect side dish for your main course! Sweet Onion Casserole: This Sweet Onion Casserole takes plain old onions and turns them into a throw-together, perfect as a side dish or main course. 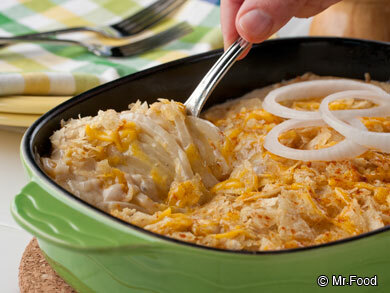 This creamy, cheesy, crunch casserole will show you a different side of onions you never thought of! French Onion Bake: Made with only 3 ingredients, this French Onion Bake will be a table favorite at your next dinner party! 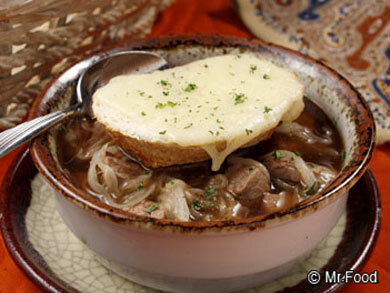 It's got the best part of our favorite French onion soup... the top! This is a cheesy, crusty, oniony bread bake that shouts "Special!" 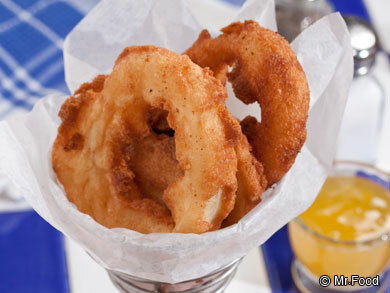 Homemade Onion Rings: Recreate the fast-food tastes of yesterday with this recipe. 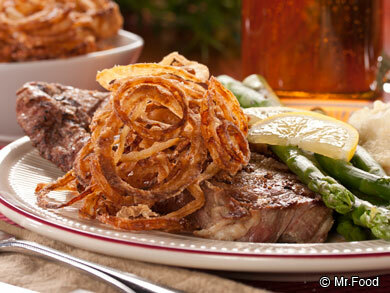 Our Homemade Onion Rings are restaurant-quality, so your gang's gonna be asking for them again and again! 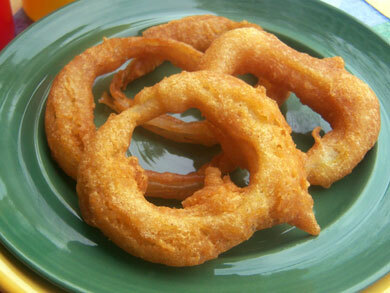 Sweet and Hot Onion Rings: These better-than-the-bar onion rings will satisfy your craving for something sweet AND hot! But we should warn you -- they're so good, you won't want to share them. Onion Strings: Our crunchy 5-ingredient recipe for easy homemade Onion Strings will make you feel like a restaurant chef. Whether you make 'em for tasty nibbling or as a main dish topper, they're always a hit and super easy! 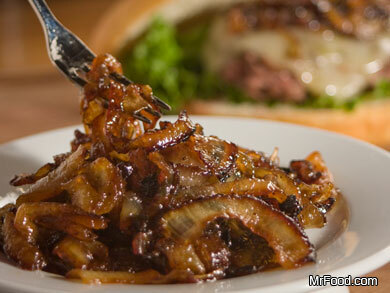 Sweet and Spicy Caramelized Onions: Some like it sweet, some like it spicy but everyone is sure going to love Sweet and Spicy Caramelized Onions. The secret to this flavor combo is sweet brown sugar and fiery hot ground red pepper. Summer Garden Salad: Mother Nature's gifts from the garden make this easy Summer Garden Salad one to savor! The fresh veggies along with the refreshing homemade dressing make it a winning duo of texture and flavor. 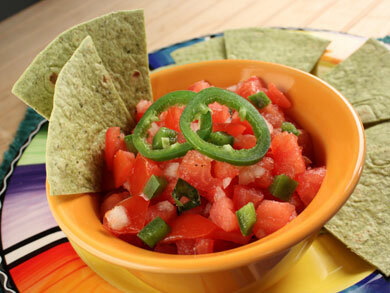 Pico de Gallo: In Mexican cuisine, Pico de Gallo is a fresh condiment made of finely chopped tomatoes, onions and jalapeno peppers. You can make it as mild or as spicy as you'd like. That's the best part of homemade! Grilled Veggies with Onion Dip: Our new version of vegetables and dip takes your taste buds from something old to something new! 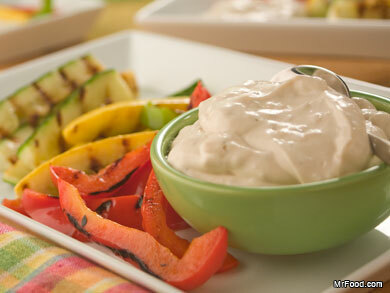 Grilled Veggies with Onion Dip is a trendier version of the classic idea, sure to win you raves.